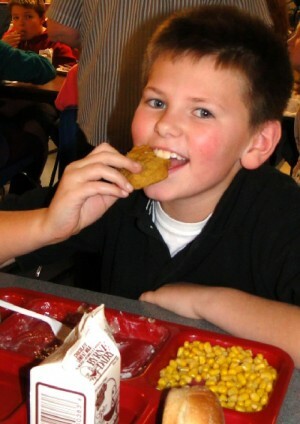 Dakota Sinclair enjoyed a dessert of a molasses cookie. MINETTO, NY – Recently, the Minetto Elementary School held its Thanksgiving feast. Families gathered to enjoy the annual event in the cafeteria. School lunch provided turkey, sweet potatoes, stuffing and corn as well as a drinks. 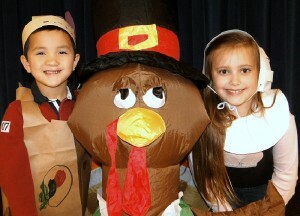 Jack Caraccioli and Zoe Lisk posed with the guest of honor at the Minetto Elementary School Thanksgiving feast.